Spring has sprung! Bradford Pears are filling the air with their fishy fragrance, baby birds are learning how to fly, and perennial wildflowers are beginning to push up through the soil. The Ohio River Valley is full of life this time of year, and native wildflowers play an important role. Many species are also edible and several others provide medicinal benefits. Not to mention they are BEAUTIFUL! They are one of the first signs of spring and are always pleasing to the eye! Wildflowers are vital to wetland and forest ecosystems. Spring wildflowers are especially important to forested areas because they are one of the first food sources to become available once the weather begins to warm, often blooming before most trees are fully leafed out. They are also a dependable source of food. Assuming no widespread disease outbreaks, spring wildflowers bloom around the same time every year regardless of how harsh the previous winter was. Wetland species are an incredibly important food source for lots of pollinators, including bees and monarch butterflies, and often act as host plants for a wide variety of animals. Also, many wildflower species persist year to year and their root systems can provide a decent amount of structural integrity in the soil around them. Unfortunately many wildflower species are threatened. Invasive species such as narrow-leaved cattail and purple loosestrife are taking over their native habitats. Narrow-leaved cattail is an opportunistic plant that quickly dominates wetland areas with monotypic strands, meaning there is no diversity of other plants where they take over. Purple loosestrife also forms strands of this nature but the plants are so dense they do not make suitable habitat for most species. The seeds of both of these plants are easily dispersed through waterways and remain viable in the creek bank for several years. The main invasive species we have to worry about here in Cincinnati is honeysuckle. 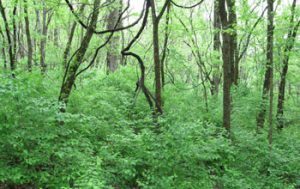 These bushes dominate forested areas and provide little nutrients or other ecological benefits. Because they are one of the first plants to develop leaves in the spring and one of the last to lose them in the fall, they block a lot of sunlight from reaching the ground. The main reason spring wildflowers are able to bloom so early in the season in forested areas is because, typically, the trees in those regions do not have leaves yet so more sunlight can reach the ground. Honeysuckle can provide a decent amount of food and shelter for animals, and they certainly look and smell nice when they bloom, but they crowd out native species to the point where they completely drive them out of many areas in Cincinnati. 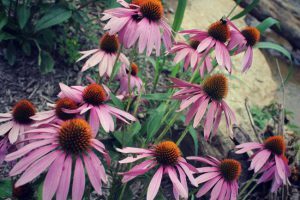 The future of wildflowers in Cincinnati sometimes may seem bleak, but lucky for them there are lots of environmental organizations tackling the invasive species problems and we are beginning to see a resurgence of several species. One such organization is Groundwork Cincinnati, which focuses on rehabilitating ecosystems along the Mill Creek (*shameless plug* come hear more about the work they do during their talk on April 20th, more info here). You can volunteer with them and several other groups to remove invasive species from natural wildflower habitats. Another way to ensure the continuance of this resurgence is to support landscaping companies that only use native species when planting flowers, shrubs, and trees as ornamentals. Lastly, go experience the beauty for yourself! There are several parks in the city with wonderful wildflower populations, such as Winton Woods and the Cincinnati Nature Center. Spend a day with them and see for yourself how many species rely on them! Some of my favorite wildflower species that are native to the Cincinnati area are milkweed, echinacea, and rose mallow. 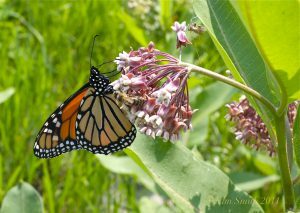 Stop by RRT to get a free packet of milkweed seeds and help out monarch friends! 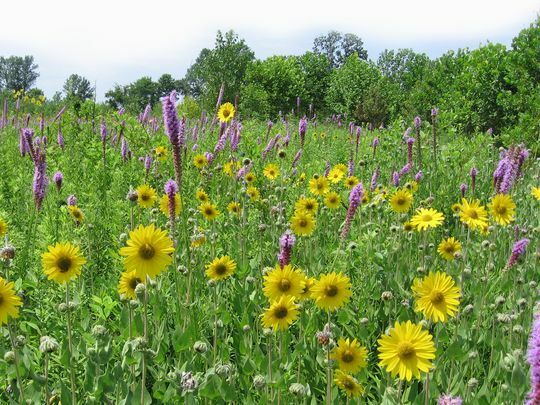 For more information on these flowers, others that can be found in this region, and to see what is blooming now check out the ODNR’s wildflower web page!